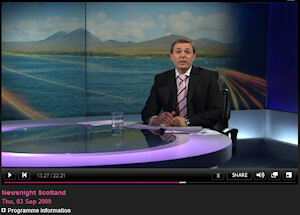 It will only be available until 11:19pm on Thursday 10th September 2009, but here's the Islay Tidal Energy project report on BBC Newsnight Scotland (link forwards directly to the start of the report). The report is almost 10 minutes long, providing views from a variety of people including Philip Maxwell of the IET. It feels a bit more balanced than other reports I've seen, highlighting some of the pitfalls this and similar projects need to avoid. Of course there are also a few nice views of Islay, that's probably unavoidable. Many thanks to Andy Macdonald of the Islay Energy Trust for pointing this out!